Why do these movies exist? Debbie: [yelling to Eric after he falls off a cliff in his wheelchair] Swim to the side Eric! Swim! Awe man i love this movie, i remember going to my friends house just to watch it, when we were little. Yes i know it is a little cheesy, but so is other stuff, and movies. 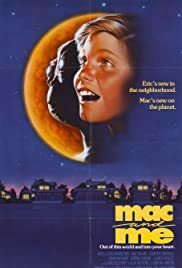 I think people should give this film more credit, it was good for it's time, still it isnt ET, but it is good in it's own way. And the guy who played Michael was HOT!!!!!! !